Clubbed Thumb mounts its 23nd annual new-works festival, one of the best ways to see which local playwrights have their fingers on the pulse. The first show is Trish Harnetiaux's Tin Cat Shoes (May 19–29), directed by Knud Adams with a cast that includes David Greenspan and Pete Simpson. Next comes Angela Hanks's Wilder Gone (June 4–14), directed by Margot Bordelon, with Crystal Dickinson and Hubert Point-Du Jour; the final show is Will Arbery's Plano (June 20–30), directed by Taylor Reynolds and featuring Crystal Finn and Mary Shultz. When you belong to a certain kind of group—employees, summer interns, a cast of actors—you develop a language of shared stories, sudden intimacies, deliberate foolishness. The harder you love your group, the weirder that language gets. You might, just to lasso an example from out of the air, greet a new coworker by doing a fully choreographed number from Guys and Dolls, accompanied on the shoe-measuring device and using a candy cane as a cigar. Trish Harnetiaux’s wackadoodle comedy Tin Cat Shoes revolves around just such a mutually adoring crew, showing us what a gang of goofballs we’re dealing with (see the above candy-cane), and then sending them into the craggy dangers of the American West. It’s like watching a dandelion puff hit a frying pan. The group’s loyalty, like this gossamer little farce itself, flashes into vapor. Having subtitled her play An Odyssey of American Acclimation, Harnetiaux seems to have asked herself, “Who among us is the diametric opposite of the lonesome cowboy?” and come up with the staff of the titular shoe store: dance nut Cheddar (Kyle Beltran), laid-back Lunch (Pete Simpson), nacho lover Pepper (Donnetta Lavinia Grays) and newbie Gemma (Emily Cass McDonnell). Four less prepared, less resourceful people you’ll never meet, despite their confident way with the “solo shoe pile” and assiduous study of customer service. 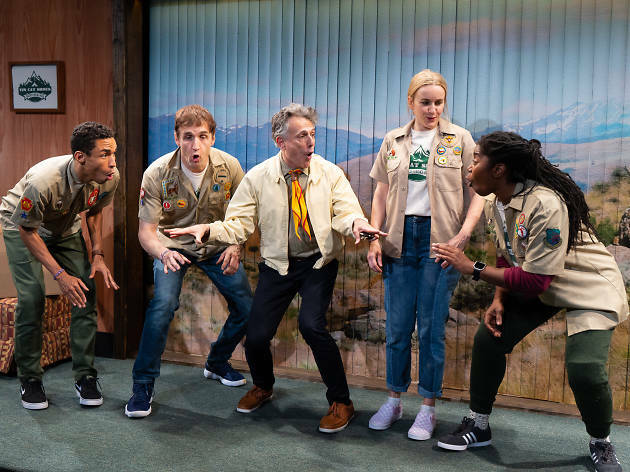 Thus we’re a bit concerned when their pop-up team-building activity, organized by beloved boss Rex (David Greenspan), entails a hike into the Yakima River Basin and a surprising encounter with a bear. Only because Harnetiaux follows a blissed-out, wherever-the-drug-takes-you dramaturgy does anyone make it out alive. As has become customary at Clubbed Thumb’s Summerworks Festival, the cast, direction and design are top-notch, though it only costs a pittance to get in. In terms of dollars per laugh, the value here is extremely high: Tin Cat Shoes is a delight in three acts, though the delight is keenest at the beginning. 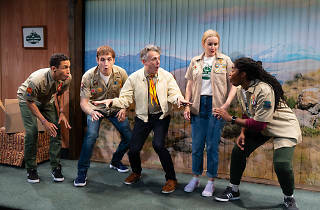 The play’s first section, when the employees are still in the shoe store, is basically perfect, with Simpson’s fuddled eyebrows waggling at Beltran’s pogo-stick energy, and Grays, who makes every word sound like a pronouncement from God, waxing nostalgic for her days at Whole Foods. Though the play constantly and deliberately undermines its urgency with silliness, it has a secret coherence from the start—a running commentary on how we overvalue work. By the end, admittedly, things have gone so bonkers that both analysis and even the humor itself start to struggle. As the plot freaks out into sheer deliriousness (a casino materializes out of nowhere, Pepper starts writing a novel that’s just a list of nacho toppings), you can feel your brain being given the night off. But come to think of it, that’s a good part of work too. Vacation, baby! There’s nothin’ like it. The Wild Project (Off-Off Broadway). By Trish Harnetiaux. Directed by Knud Adams. With ensemble cast. Running time: 1hr 30mins. No intermission. Through May 29.